It it tough to come up with color ideas for all of our new boats! 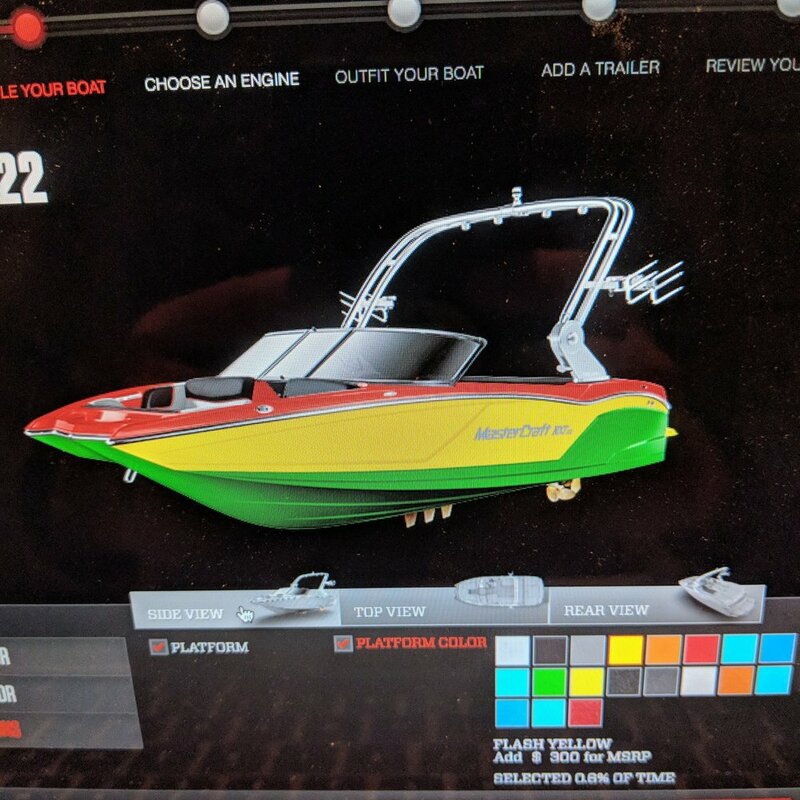 Help us out by heading to the MasterCraft website to design your ideal 2019 NXT 22. The winning design(s) will not only get to see their boat come to life but we will also send you a camp SWAG package in the mail. Follow this link --> MasterCraft <--- to get to the NXT22 boat builder site. If you don’t contribute your ideas we may just have to build the rasta boat! where's the wake boat version? I love Tesla. I love how they are reimagining the future of automobiles, home power and mass production. This concept electric boat utilizes two Model-S 'engines' to create 1800 horsepower! We are still waiting for an all-electric wakeboard boat. Thousands of pounds of batteries would pump some serious wake and help us reduce our carbon footprint each summer. Someone dial up Mr. Musk and tell him to get cracking! At Water Monkey Camp we do not have many rules...we want campers to listen to our coaches, respect each other and the environment, eat well and take an occasional shower. One hard and fast rule, however, is we do not talk politics. A simple political discussion can morph into a heated argument as individuals try to express their own deeply held beliefs. That being said, this open letter in "Boating Industry" magazine (link below) is some non-partisan wisdom from a guy who certainly knows his stuff. The letter is not long and quite worth the read. Mr. Yeargin runs one of the largest boat companies in the world (Correct Craft manufactures Nautique boats), has served on the Commerce Department Manufacturing Council on behalf of U.S. manufacturers, and has traveled the world conducting business in dozens of countries. All of this has given him a unique perspective on U.S. policy that he concisely shares in his letter. Just because we do not get political at camp does not mean I did not vote! Finn helped me vote this year. Year five was also the second year at our permanent property and we are really starting to get comfortable now. Seeing campers and staff take advantage of our epic location by playing Spikeball on the beach, having flipping contests off the dock, lounging in the hammock chill zone, or engaging in intense ultimate Frisbee matches on the field is just an added bonus beyond the time spent on our ridiculous boats. Speaking of boats, the 2016 Mastercraft NXT22 was the perfect addition to our program. It is versatile and ideal for teaching and shredding! We told everyone this summer that we would be replacing the 2015 Axis A22 for next year but, by overwhelming popular demand, we will be running it for one more summer. It is just loved by so many of our staff and campers that there is no rush to get rid of it yet. Now some fun 2016 stats! Campers came from 13 states (AS, CA, CO, CT, DC, FL, MA, MD, NH, NJ, NY, OH, VA) as well as Canada, China, Dominican Republic, France, Hungary, and Turkey! Next summer is a ways off still but it is not too early to start planning! Enrollment is officially open and some families have already reserved spaces for their campers. As you start thinking about next year I hope that you will keep us in mind for a week or two of camp for your camper(s). Word of mouth is far and away our biggest recruiting tool so please help us fill our bunks and take advantage of our $300 referral bonus for each camper you send our way who enrolls for at least one week. I hope you all have a terrific year until we see you again and feel free to e-mail, call, text, write, Skype, or visit any time! We are into our first ever fall at the new property! That means crisp, beautiful days, a lake all to myself, and thousands upon thousands of falling leaves. I have always loved fall clean-up time and the instant gratification you get from making the property look great one last time before it is blanketed in snow. Step one is raking. Step two is raking. Step three is raking some more. After building 50+ piles of leaves around the cabins and fields I went to work transferring them to tarps and dragging those tarps to the woods to dump. The whole ordeal only took about 20 hours over three days and now the place looks great just in time for Thanksgiving. Fall clean-up is just one aspect of getting the property ready for the winter. Here is everything else I have done! 'Winterize' the pipes - because most of the buildings at camp are not heated we have to drain all of the water pipes, toilets, sinks, etc. That requires going under each cabin with an air compressor, blowing out the lines, and using a bit of antifreeze to make sure there is no water trapped anywhere that could freeze and break the pipes. Deactivate the fire alarm system - we have a state of the art fire alarm system in our cabins and buildings but it has to be turned off for the year when we are not around all of the time. This was fairly straightforward after reading the manual and inspecting some diagrams. I had to disconnect the back-up batteries and the turn off the electrical circuit powering the system. Pull in the docks - our fantastic deep-water docks cannot stay in the lake all winter so we have to disassemble and remove them from the water. There are two large sections that we detach and float to the marina to be hauled on land for storage. The last piece we manually pull up onto the beach. Storage - everything from the outside gets moved in. That includes picnic tables, sports equipment, chairs, paddleboards, etc. Winterize and store the boat - You cannot just plop the boat on land and leave it until the spring. Because the engine uses lake water for cooling it needs to be drained and flushed or else trapped water could freeze and burst portions of the engine. We also have six ballast tanks and bags that fill with water to create our epic wakes which have to be flushed with antifreeze as well. This year the boat is being stored indoors so no shrink-wrapping! I will post more pictures throughout the winter! Happy Thanksgiving!